Who says salads have to be rabbit food? This one is a meal all by itself. This salad bridges the gap from autumn in to spring and I found some baby pumpkins lurking in the fridge that were begging to be used. 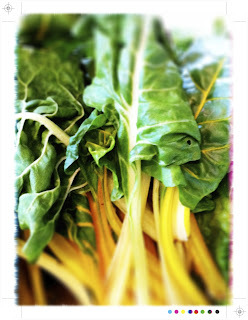 Those and some beautiful chard in the veggie box this week were the inspiration for this salad. I wanted something filling and satisfying, healthy but with just a sprinkle or 2 of indulgence... what I call balanced. For all of you in the USA this would also make for some a little lighter fare on the side for Thanksgiving. Any mixture of any leafy greens would work here, kale, cavalo nero or even spinach. 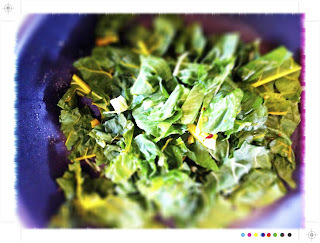 If using spinach I would go with baby spinach and have the leaves raw, it would be a lighter version but just as good. Other nuts would also work equally well, maybe some walnuts or cashews. I do love a little heat so chilli flakes added to every layer. For a little less heat just leave a little of the chilli out. 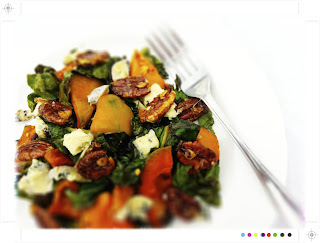 This is a rustic salad to the quantities are really just a guide, mix it up as you wish. 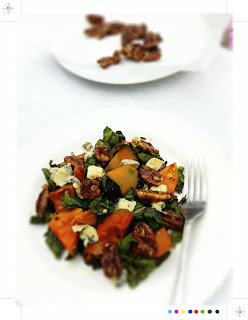 Though I certainly wouldn't go to easy on the Kikorangi or the candied pecans as they really make this a great salad. For you non Kiwis Kikorangi is the most fabulous blue cheese, golden and creamy and just a little piquant. So if you are not lucky enough to be able to get your hands on some Kikorangi use your own favourite blue cheese. Kikorangi, or your blue cheese of choice. If you are not a fan of the blue you could try feta. Place the pumpkin on a baking tray, drizzle with a little olive oil, season with a little salt and sprinkle over a pinch of chilli flakes. 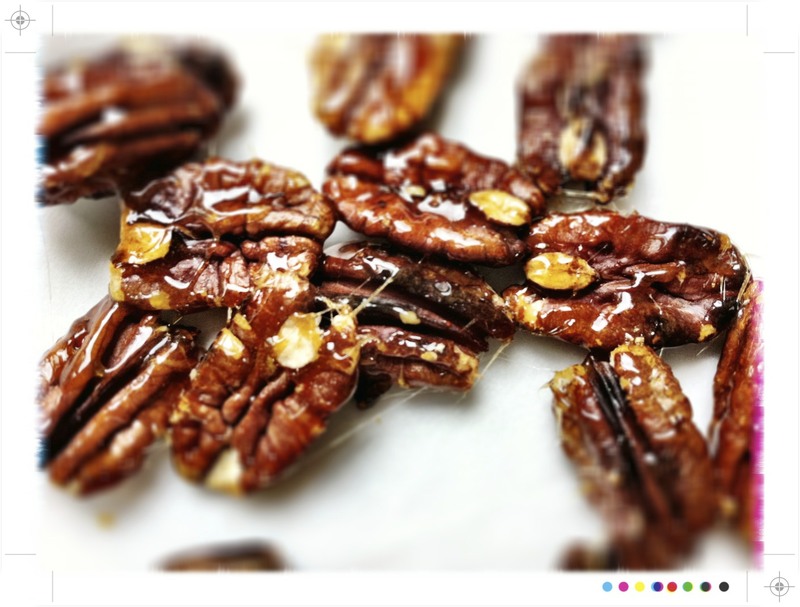 Pop in the oven and roast for 20-30 minutes or until well roasted. I like my pumpkin well fired, but if you like yours not so done just take it out a little earlier. Wash and drain the greens and take the leaves off the hard stem. Roughly chop, and I do mean a rough chop as this is after all a rustic salad. Heat a little olive oil in a frying pan and toss in the greens. 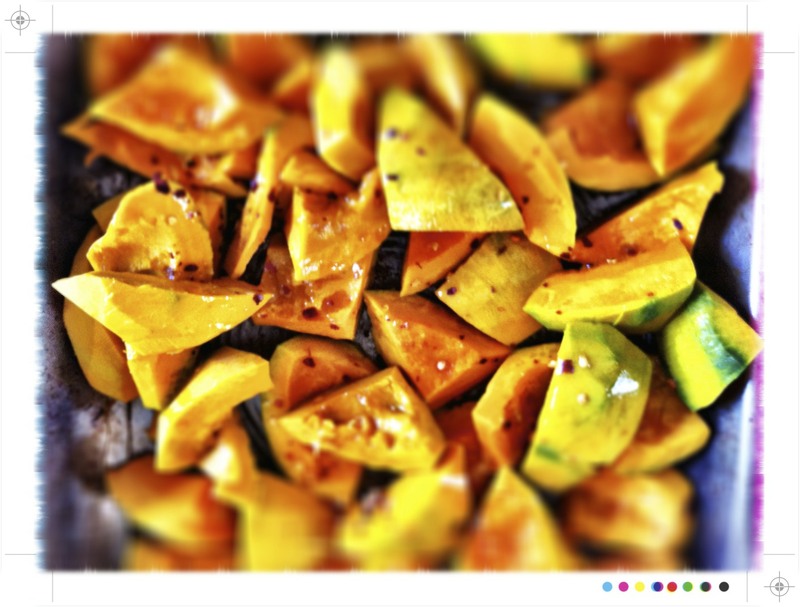 Sprinkle with a little salt, a pinch of chilli flakes and a little nutmeg. Saute until the greens are softened, 5-10 minutes. 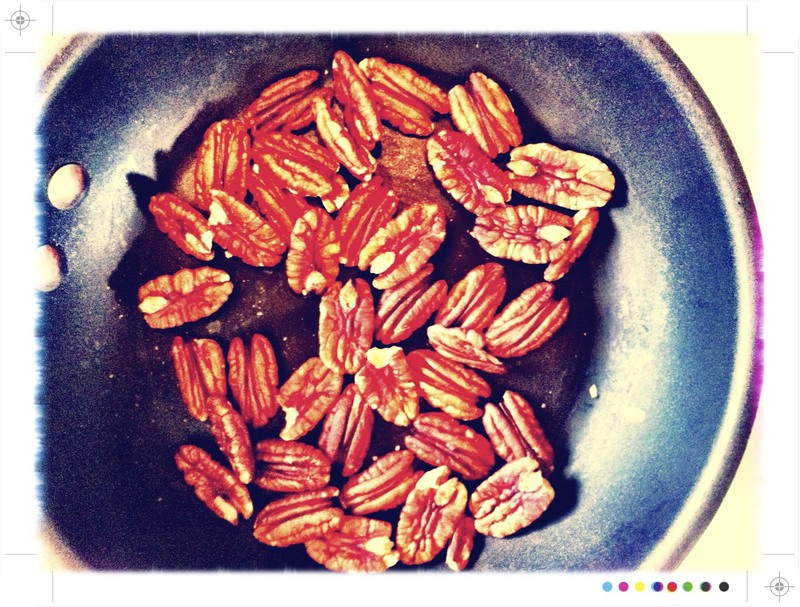 Meanwhile toast the pecans. Just place in a small frying pan and dry fry for a few moments just until toasted. As with all nuts there's a fine line between toasted and cremated so keep an eye on them. 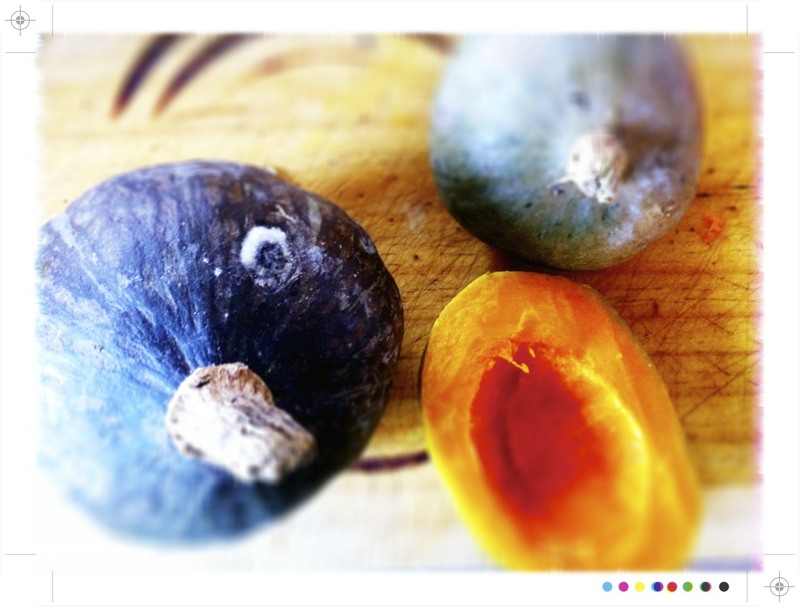 Remove from the heat and set aside. While the greens are sauteing place the water and sugar in a small saucepan over a medium heat and stir to dissolve the sugar. Increase heat to high and cook, brushing down sides of pan with a wet pastry brush if sugar crystals form, until mixture is golden, about 10-15 minutes. Just before it is done scatter over a few chilli flakes. Have a sheet of baking paper laid out. Like with toasting nuts a fine line between golden and burnt....so a close eye is required here too. 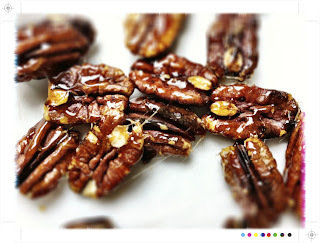 Quickly toss in the pecans and stir to coat with the caramel, you need to work quickly here before it hardens. Place the pecans on the baking paper to cool and harden. Once a little cool you will be able to separate then with your fingers. Toss the greens with the pumpkin and top with the crumbled Kikorangi and some candied pecans. Serve straight away. The earthy leafy greens stand up to the sweet roasted pumpkin and the cheese every so slightly melts, wonderfully creamy and salty all the same time. A little heat from the chilli through all the layers and textures and then all topped it all off with the pecans...toasty, nutty and a wonderful sweet crunch. 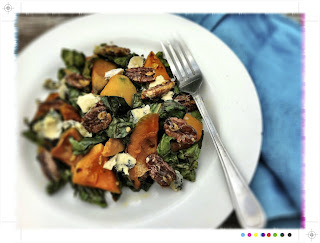 Totally agree, I can't do rabbit food style salads so yours is perfect with pumpkin and blue cheese and I love the chilli pecans. Generally I don’t learn article on blogs, however I would like to say that this write-up very forced me to check out and do it! Your writing taste has been amazed me. Thanks, very nice post. Beautiful, this is exactly the type of salad I adore! It's hearty and flavorful with some of my favorite ingredients. I just wish I could find kikorangi! @wedding venues Thank you so much, so happy that you liked it.